WASHINGTON For the first time, America's racial and ethnic minorities now make up about half of the under-5 age group, the government said Thursday. It's a historic shift that shows how young people are at the forefront of sweeping changes by race and class. The new census estimates, a snapshot of the U.S. population as of July 2012, comes a year after the Census Bureau reported that whites had fallen to a minority among babies. Fueled by immigration and high rates of birth, particularly among Hispanics, racial and ethnic minorities are now growing more rapidly in numbers than whites. Based on current rates of growth, whites in the under-5 group are expected to tip to a minority this year or next, Thomas Mesenbourg, the Census Bureau's acting director, said. 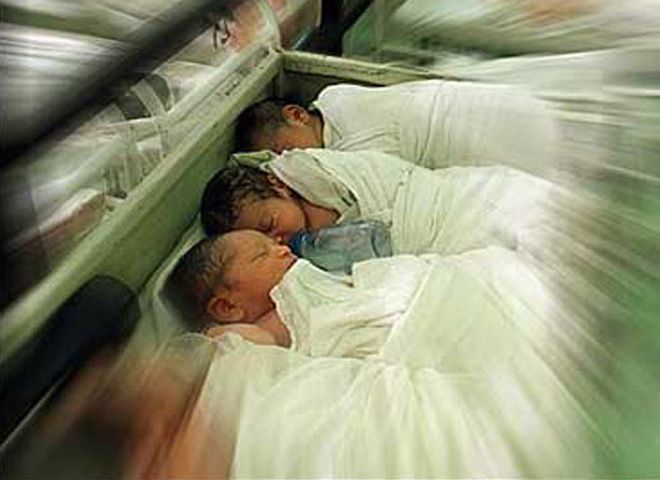 The government also projects that in five years, minorities will make up more than half of children under 18. Not long after, the total U.S. white population will begin an inexorable decline in absolute numbers, due to aging baby boomers. The imminent tip to a white minority among young children adds a racial dimension to government spending on early-childhood education, such as President Barack Obama's proposal to significantly expand pre-kindergarten for lower-income families. The nation's demographic changes are already stirring discussion as to whether some civil rights-era programs, such as affirmative action in college admissions, should be retooled to focus more on income rather than race and ethnicity. The Supreme Court will rule on the issue this month. Studies show that gaps in achievement by both race and class begin long before college, suggesting that U.S. remedies to foster equal opportunity will need to reach earlier into a child's life. "The educational system is likely to be the most widely used and most acceptable policy tool we have for equalizing life chances. But it does not seem so far to achieve this goal," said Timothy Smeeding, an economics professor at the University of Wisconsin-Madison who specializes in income inequality. "This specter of unequal opportunity may be the biggest negative social outcome of the continuing American inequality boom." Among the under-5 age group, 22 percent live in poverty, typically in more rural states such as Mississippi, Arkansas and Louisiana. Black toddlers were most likely to be poor, at 41 percent, followed by Hispanics at 32 percent and whites at 13 percent. Asian toddlers had a poverty rate of 11 percent. "More so than ever, we need to recognize the importance of young minorities for the growth and vitality of our labor force and economy," said William H. Frey, a demographer at the Brookings Institution who analyzed the census data. Smeeding's analysis of the latest research and data on social mobility, provided to The Associated Press, shows that a child's achievement varies widely depending on a parent's education and income. The reason: More educated parents tend to have fewer children and generally earn more money than before, allowing them to spend larger amounts of time or money on a child's development, including music or art classes, extra tutoring, or travel and summer camps. The gaps in achievement tend to emerge early in childhood, continuing through high school, and disparities are especially evident in SAT admission scores. College Board data show that average scores spread as wide as 130-140 points in each of the reading, math and writing sections for a student with family income of less than $20,000, compared with a student with family income exceeding $200,000. About 40 percent of whites age 25-29 graduate from college, compared with 15 percent for Latinos and 23 percent for blacks. Mr. Obama proposed expanding pre-K education for any 4-year-old whose family income was below twice the federal poverty rate, or $46,000 for a family of four. That is an increasingly minority age group that would benefit from what President Obama calls the single most effective way to boost educational outcomes. The plan would be paid for by a nearly $1 per pack federal cigarette tax. But at a time of strapped federal budgets, Republican lawmakers have been reluctant to expand the scope of government or raise new taxes. Medicare and Social Security costs due to aging of the mostly white baby boomer generation are also adding to the government burden. A recent Rutgers University study found that state funding for pre-K programs had its largest drop ever last year, with states now spending less per child than a decade ago.